Good evening folks...it's Mark Harvey here offering another FREE download of one of my tracks. 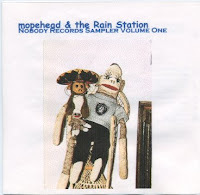 Here is a FREE mopehead MP3 download of Revolution taken from the Nobody Records Sampler Volume One. Rain Station's "The Living Room Sessions". Revolution is an instrumental groove. Charlie Harrelson- Founder of EvO:R (click here to visit EvO:R)and solo guitarist TL2 took this instrumental and recorded some nice lead guitar work over it - if I can find that version I'll post it. During these times leading up to the election I thought this was a fitting download for ya'll. Maybe this mellow groove will help calm the masses since the election of either gentleman could possibly start a Revolution. Good EARLY morning everyone. Here is a FREE MP3 download of Thank You taken from the Nobody Records Sampler Volume One. Another mopehead song I recorded on the old 4-track. This tune features samples of Richard McGhee *Star Vocalist* (click here to check him out LIVE). The samples on "Thank You" were taken from a live recording (off the board) at a Halloween party at the Rain Station. We hired Richard McGhee *Star Vocalist* to be the entertainment at our party and I got a first class recording of his show (what a show it was!). My friend Jay Moores first met Richard performing at Cafe Du Nord. Jay asked Richard if he could do a documentary on him for public access TV (I got to be the host of the documentary...very cool). Jay recorded many of Richard's shows on VHS. Richard gave Jay and I many of his practice tapes that he recorded in his small Tenderloin apartment on a karaoke machine. Jay and I wrote a bizarre musical based on Thomas Edison's life. Richard was to play Edison, but he died of cancer about 2 weeks before we started. Richard's drive to be a star was amazing and is an inspiration to me every day. From Jay's website..."I met Ricard McGhee at Cabaret Du Nord in San Francisco's Castro. It was open mic night, and I really was touched by Richard's love for singing. He was an old guy, that didn't want to give up on his dream of being a singer. We became very close friends, and after a few years he became a cult favorite in the Bay Area. Bands like Smashing Pumpkins demanded that he would open for them, and he was in a few nifty rock videos by the band Swell. I love Richard, and he was going to play Thomas Edison in my musical movie project called, Thomas Edison's Daughter. However fate only allowed us to record his vocals, as he was diagnosed and died of cancer three weeks before we started to shoot. He was a great man, and inspires me to always live my dreams to this day." The Smashing Pumpkins show was amazing - Jay and I both wore our Richard McGhee *Star Vocalist* t-shirts as we were he entourage. Very, very cool moment in my life. I plan to add more early Rain Station and mopehead tracks so keep an eye out and visit often. Your comments are appreciated.